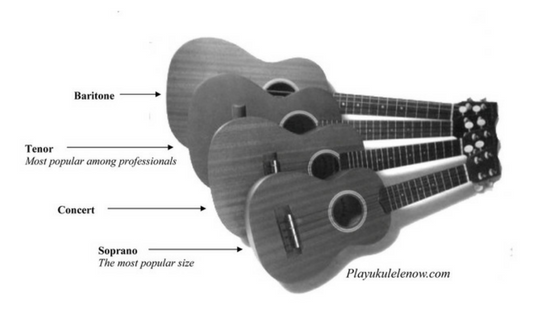 Play Ukulele Now: All about Ukulele Sizes: What size do I get? What's the difference? 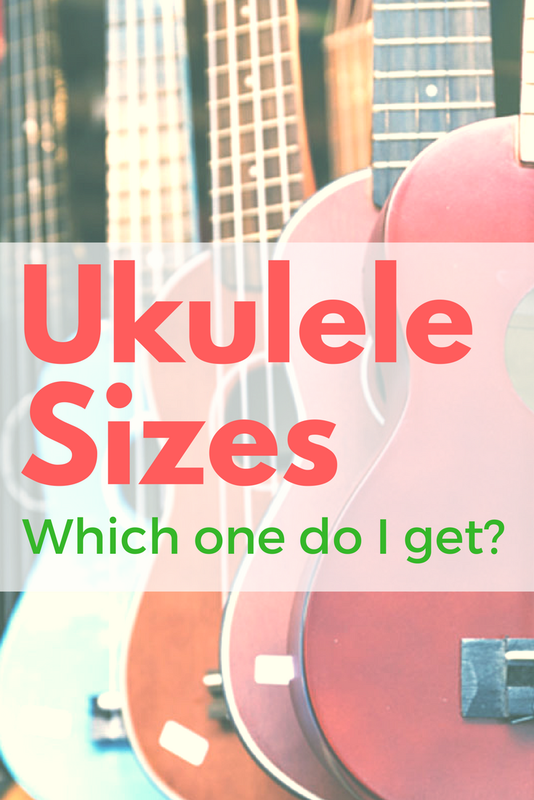 All about Ukulele Sizes: What size do I get? What's the difference? The ukuleles pictured below are all Makala ukuleles by Kala, the MK-S, MK-C. MK-T and MK-B. These are great starter ukes and they are recommended by most teachers and are great for schools and clubs. 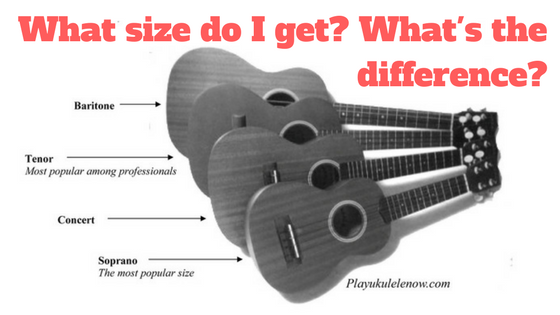 What makes each ukulele size sound different and play differently is the scale length and the body size. What is Scale length? How dose it differ from one ukulele to another? The scale length is the length of the strings between the nut and the bridge. The soprano, smallest ukulele has the shortest scale length at about 13" (this will vary from one brand to another), and baritone the longest at about 19". The soprano ukulele is the smallest and most popular among the standard sizes. This is the one you will most often see and hear. 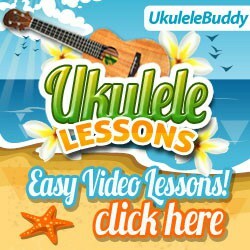 The soprano ukulele is the best choice for a starter ukulele not only because it is the most popular size but also because it is the least expensive option. There are lots of great choices for inexpensive starter ukulele, many of them available in a rainbow of colors. Some of the most popular choices for inexpensive starter ukes would be the Mahalo, Diamond Head, or Makala colored ukes. If you don't like the colored ukes popular choices would be Makaka, Kala, Ohana, Laniki and others. The larger the ukulele is, the deeper and warmer the sound is. If your buying your first ukulele it might be a good idea to go to a music store where you can hear how the different ukuleles sound. Although the soprano ukulele is the most popular and least expensive, you may prefer the sound of a larger ukulele. The concert ukulele is a little larger than the soprano. It has a little deeper and a little warmer sound. It dose not have that traditional high pitched sound that the soprano has. With larger ukuleles the frets are further apart, for this reason some folks may find that larger ukuleles easier to play. Most professionals prefer the tenor ukulele. This is because many professional players will use more complicated chords which will be easier play with the tenor because the frets are further apart, providing more room for complicated chord fingerings. The tenor has a deeper, richer, warmer sound than the others, since it is larger. Also as the ukuleles get larger the string tension is higher. This makes the strings on the soprano the easiest to push down because it has the least amount of tension. Since the tenor is tuned to the same notes as the concert and the soprano and has the longest scale length the string tension is is the highest of the three. Sometimes tuned the same as a guitar: DGBE, special strings are required for this tuning. The baritone ukulele is more like a small guitar than a ukulele. It typically not tuned the same as the others, (It can be but special strings are required to do so). It is tuned the same as the top 4 strings on a guitar. Could be tuned with a standard "C" ukulele tuning: GCEA, but a special set of strings designed for that tuning is required. Get FREE 2 day shipping on your uke stuff by trying Amazon Prime!